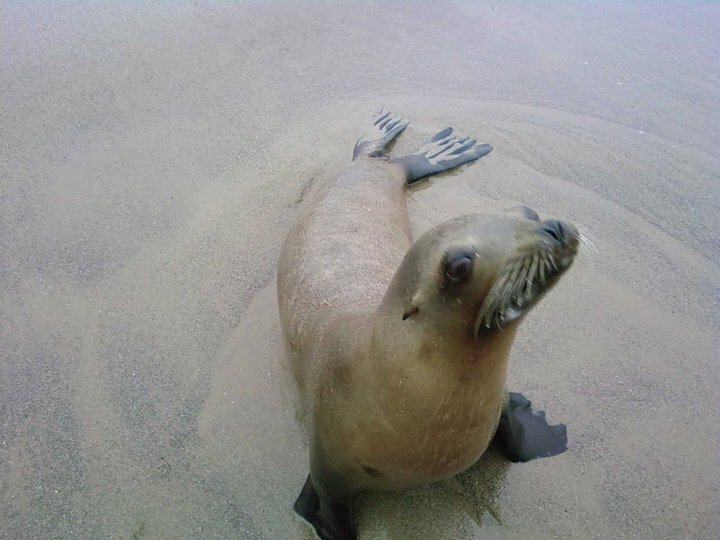 “Oscar,” a sea lion, was a victim of Domoic Acid toxicity which attacks the neurological system. I sat with him in the water from 12:00 a.m. to 4:00 a.m. a few nights ago holding his head above the water so he would not drown, within minutes we had developed a trust. He lay across my lap occasionally kissing my cheek while I encouraged him to fight…and he did. After each seizure and tremor, while foaming at the mouth, he would lift his head and move what little he could…never taking his eyes off of me. After 4 hours, I went home to change my wet clothes and when I returned he was gone. He showed up again the following day as I was taking a walk and was in worse condition than before. As people looked on pointing, gawking and taking pictures of him fighting to stay alive, I went out, pushed him back into shore. He responded to my voice and rested his head on my feet…if I moved, he followed as much as he could. As I yelled at him to fight, a little girl about 9 years old asked me why he was suffering so. She said “it’s not just him, it’s us watching him.” I hugged her and she cried in my arms. Oscar died the following morning. I am so grateful for the experience yet so devastated by the impact his death has had on me and the suffering he endured. I found 6 dead seals who more than likely suffered as he did…that was in a few day period on just a small portion of the beach. He was just another casualty of Domoic Acid toxicity. To see this first hand is heart wrenching, yet to experience the love and trust from this little guy is overwhelming and heartwarming. Without exchanging a single word, I learned something from him that will forever change my life…he left me with a quest, a desire and a purpose…and that’s what I needed!